Foliage Type: Grass-like, long, linear, thick, green foliage. 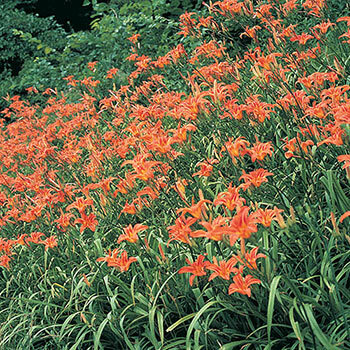 Flower Form: Up to 5" double trumpet blooms with light ruffling. Planting Instructions: Give this strong grower plenty of space in the landscape. Dig a hole deep and wide enough to accommodate the roots without bending them. Firm soil and water thoroughly. Soil Requirements: Adaptable to a wide range of soils, except over wet types. Pruning: Remove spent flower stems to keep the plant clean and tidy, after flowering. Winter Care: Apply mulch the first winter to prevent heaving of plants from the ground due to alternate freezing and thawing temperatures. Foliage is dormant in winter.